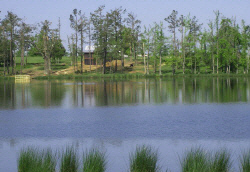 Our lake fishing hideaway makes a perfect vacation, retreat, or reunion spot for families and groups that like to fish! 10 can comfortably sleep right next to the lake. Can you see the cabin hidden among the trees on the lakeshore? This is REALLY SECLUDED lodging! Here's a closer look at the mountain cabin. You can review interior photos, plus find links to available rental dates and log cabin floor plan for lake rental HERE. The lake can accomodate up to a 10 horsepower motor. For getting quickly out in the deep water or around the shore to the shallows where bass love to hide, most anglers find that a trolling motor is perfect. Catfish are most active at night. Bass love the twilight, too. And so will you! Fishermen staying at The Lake House enjoy how the fish keep biting right up until dusk. Canoes and Small Boats Welcome! Our sturdy dock is located just a few steps from The Lake House cabin's screened porch and walk-out basement. 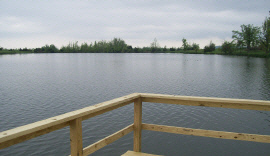 Besides the dock, there is a convenient landing area for launching canoes and other small boats. We'll even provide a large canoe for you to use on our lake. We also keep Kayaks at the office if you would like to borrow them. You are welcome to bring your own trolling motor (up to 10 hp maximum).